If you’re reading this, you’re most likely interested in putting your money to work in the market. But maybe you’re also the kind of person who feels like the market is a little bit too risky for comfort. Luckily, there’s a solution for you. Creating a portfolio that never loses money and participates in some market upside may sound too good to be true, but it’s no fairy tale. Sophisticated institutions have been doing it for decades, and now you can as well. In this short guide we’re going to show you how it’s done. 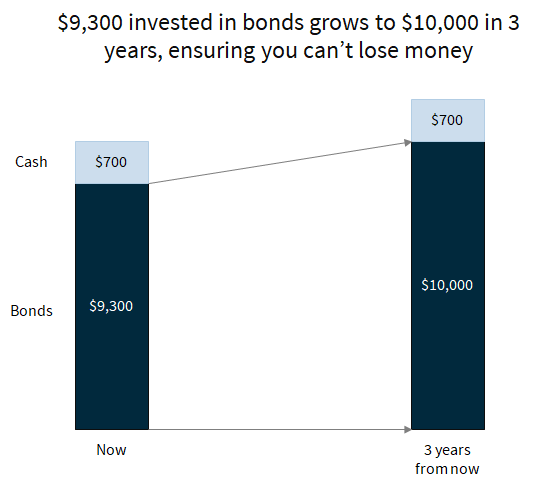 First things first—what is a bond, exactly? A bond allows the government to borrow money from you for a certain set amount of time. In return, you’re paid back the original principal, plus interest. Let’s say you have $10,000 that you want to grow in the market for a period of three years. The first step is to use some of that money to buy a bond, such that you get back $10,000 after three years. The current interest rate for a three-year US government bond is 2.4%, meaning that putting $9,300 into a bond now would become, in the span of three years, $10,000. That leaves $700 left over now that you can invest in other things. Notice that even if you lose that $700 completely, you’ll still end up with your original $10,000 at the end of three years. That’s how you can ensure you can’t lose your original savings. How can we put that extra $700 into something that will appreciate with the market? One way to do this is to use the $700 buy an index of stocks like the SPX 500. That way your portfolio will grow with the market. A better way to get exposure to stocks is to buy what’s called a “call option” on the SPX 500. A call option gives you the option (hence the name) to buy the S&P 500 at a particular price of your choosing; professional money managers have been using these for decades. 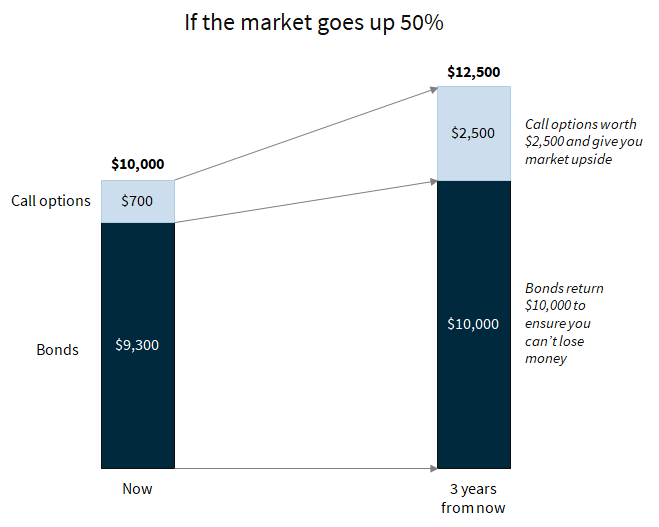 Let’s examine what happens to that $700 in a few different scenarios if its invested in call options. 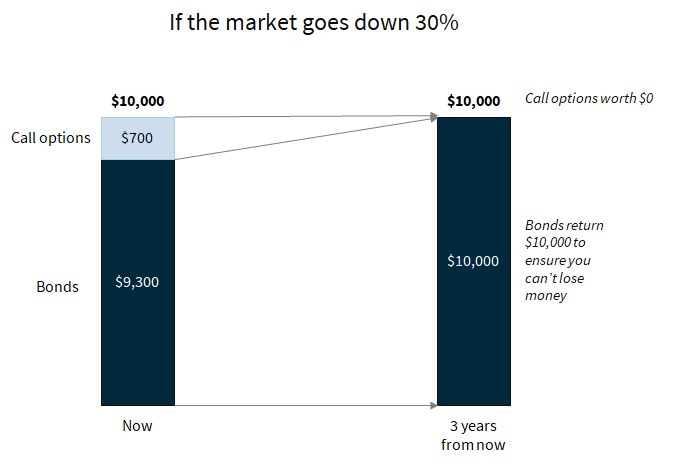 But if the market is up to $3,725 in three years’ time, then the option to buy the S&P 500 at the price of $2,700 is worth a lot more: you can buy the S&P 500 at $2,700 and then turn around and sell it at $3,725. The graphic below shows you how much you would make in different scenarios by using the $700 we have left over to buy call options. The good thing about buying a call option? You can never lose more than you put in. There you go. We’ve constructed a portfolio that seems to have magical properties. If the market goes down, you get back your original savings. If the market goes up, you participate in some of the upside. In our example if the market went up 50%, we get back $12,500 on an investment of $10,000, which is a 25% return. This strategy allows you to participate in a portion (half in this case) of the market’s growth while ensuring you can not lose money. You can create this portfolio using most brokerage accounts. If you’d rather someone else handle all the complexity for you, you can sign up for early access to the Benjamin annuity. It recreates this strategy with some additional benefits (tax deferral, longer terms than what you can create in your brokerage account) for 0.09% a year. The above is a guest post by Mark Allen from Benjamin. As my readers know, I’m a big believer in ETF investing, but I thought their take on “no loss” investing was interesting and something worth considering.